A program to create full feature DivX files (create the final .divx file). 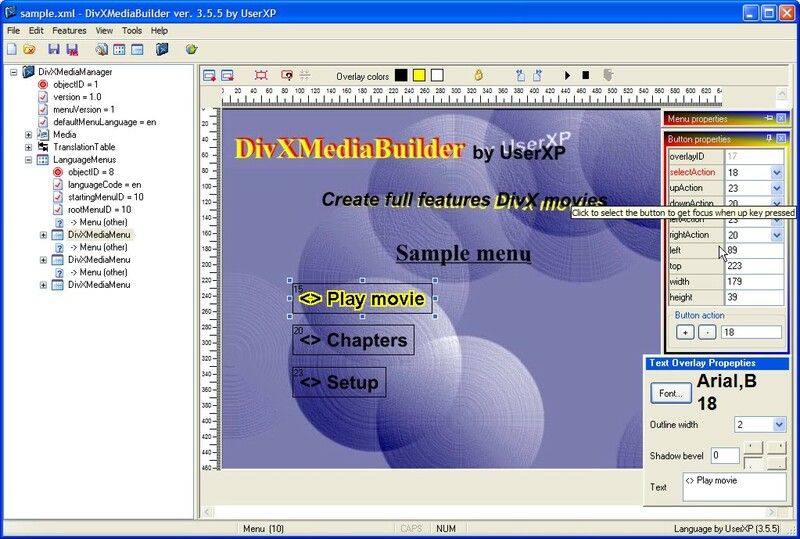 DivXMediaBuilder is a program to create full feature DivX files (create the final .divx file). Can create the final xml file that DivXMux needs. Also can create the menu files with buttons and overlays of user choice. There are some overlays that come with the program, but a user can create their own. Here is a tutorial about how to create your own overlays and how to name it. Setup menu – At previous menu (chapter) the user can go to setup menu where can select the audio and subtitle track. The above menus are auto created but the user can change them. Also no need to change/modify any action. The menus are ready for play. A new submenu "Menu for Audio/Subtitles setup.." at menu Tools. You can use this to automatically create a setup menu for your file. This will work if the file has more than one audio tracks and/or at least one subtitle track. Added more options for the titles, chapters and setup menus. Also a user can save the settings there.